Eating is about more than food and nourishment… it’s an experience. 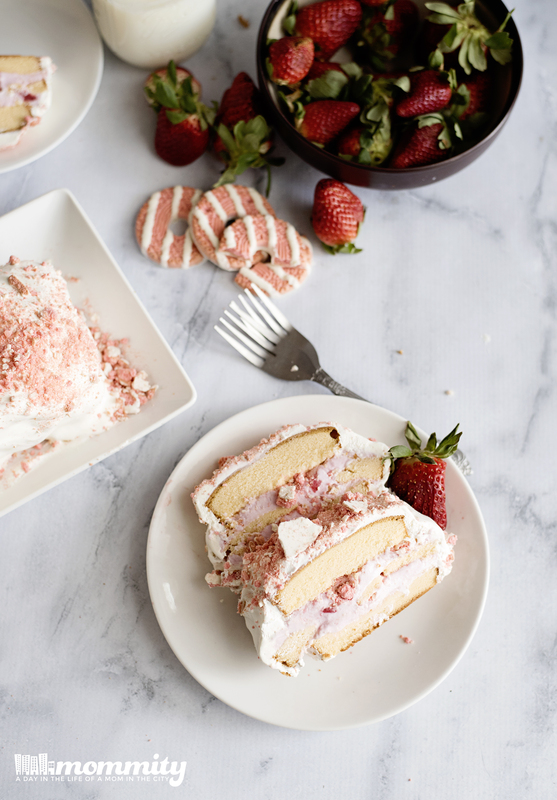 This Strawberry Shortcake Ice Cream Cake Recipe proves just that! 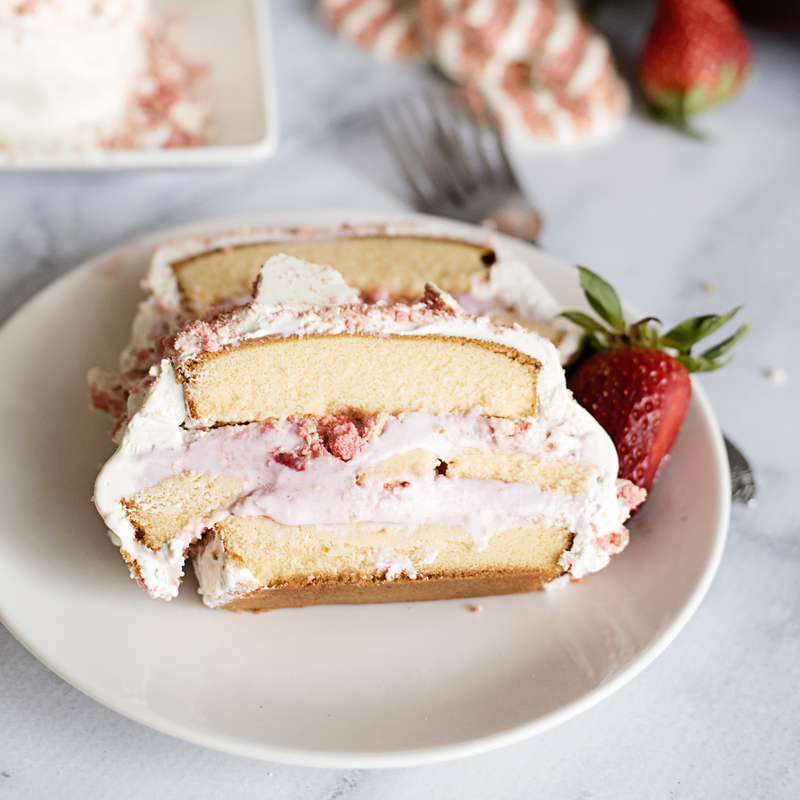 This easy strawberry shortcake ice cream cake recipe is not your typical sweet dessert treat. It’s one of those recipes that you add to the family cookbook, and that appears in family memories for generations after! 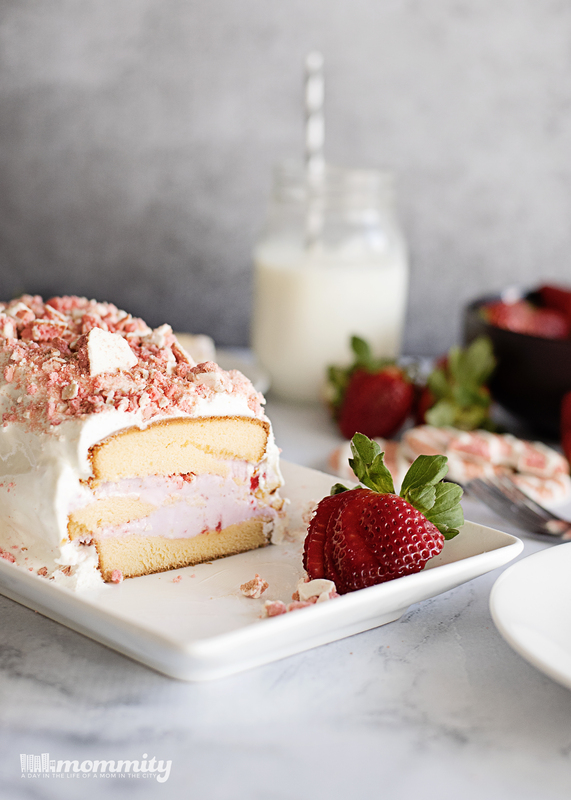 While there are different strawberry shortcake ice cream cake recipes, many of which are equally tasty, I make this light and refreshing summer dessert recipe a bit different than most. 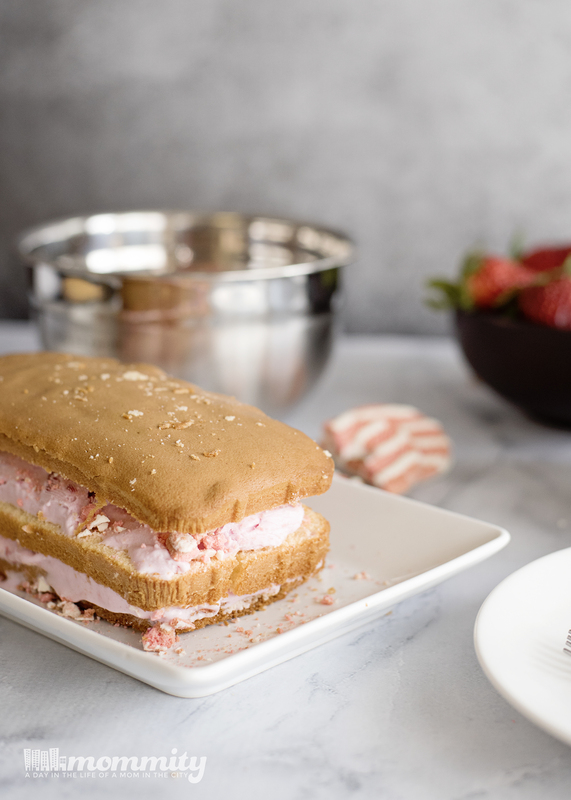 I use strawberry fudge stripe cookies, frozen pound cake, with strawberry topping and whipped cream for this bright and eye-catching sweet treat. Although it does present as a fancy look dish; this recipe is surprisingly simple and something that would be very easy for the kids to pitch in and help with. The simple ingredient list also helps to make it a pretty affordable dessert recipe in itself. To start, I cut pound cake slice into 3 layers. I also make sure to line the bottom of my loaf pan with plastic wrap. This comes in handy when it’s time to remove the strawberry shortcake ice cream from the pan later. Once my pan is lined and my pound cake is all prepped, I begin layering the pound cake in the pan. You don’t have to layer your ingredients in any particular way. In fact, you can really customize this dessert recipe and make it your own by getting creative with your layers! Add a layer of strawberries or even some crumbled strawberry fudge stripe cookies to the top to finish it off. Just like with other layers, this can be your very own unique touch to the recipe. Insider tip: If you use actual strawberries they will freeze while setting in the freezer. If that bothers you, then consider using strawberry ice cream with chunks and strawberry fudge stripe cookies instead. They’re easy to shape and crumble! Place them in a bag and crunch them with your hands or a rolling pin and sprinkle them onto the surface of your cake. Once you’ve added all of your layers and decided how to top off your cake; pull the sides of your plastic up and cover the top loosely. 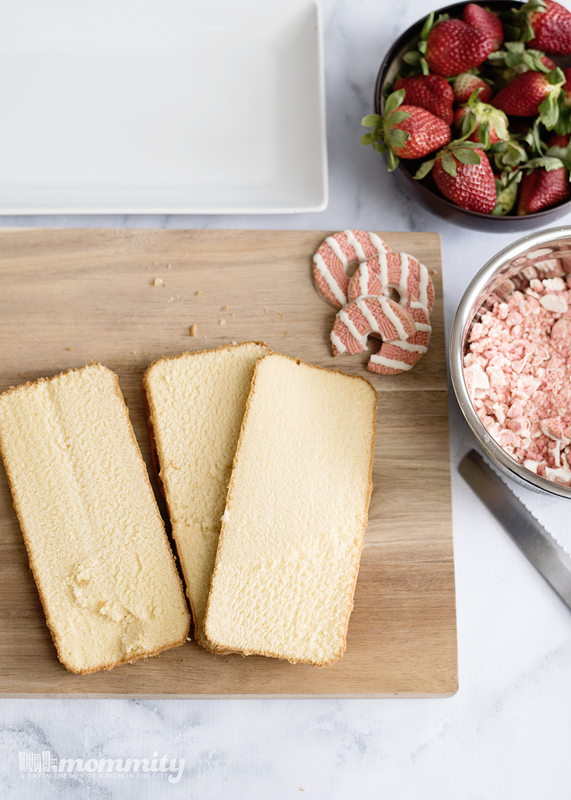 Place your strawberry ice cream cake in the freezer for a few hours to let it set and then slice and serve! What’s your favorite ice cream cake recipe? Drop a comment below! Start by thawing the frozen pound cake with the instructions on your cake. Once thawed, slice the pound cake into 3 equal layers. 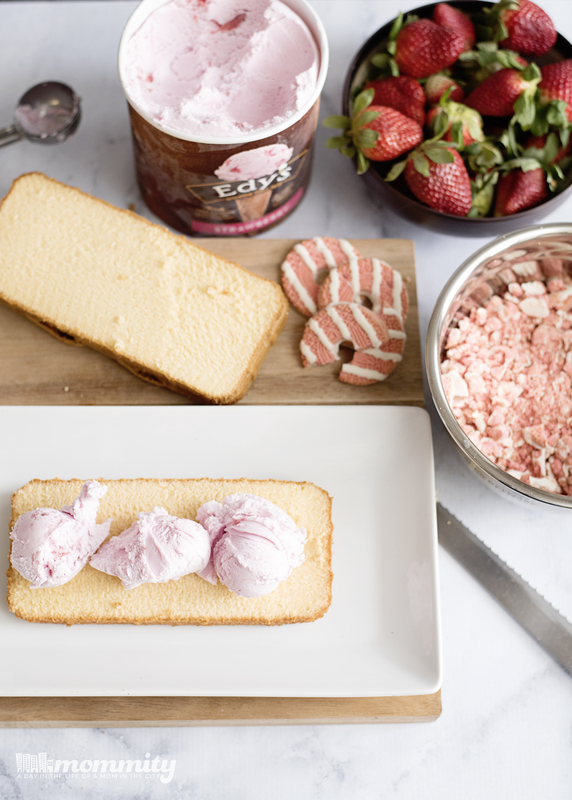 Place the first layer onto your plate, spread a thick layer of strawberry ice cream and top any way that you like. For mine, I topped with crushed up strawberry fudge stripe cookies. Add the next pound cake layer and repeat. 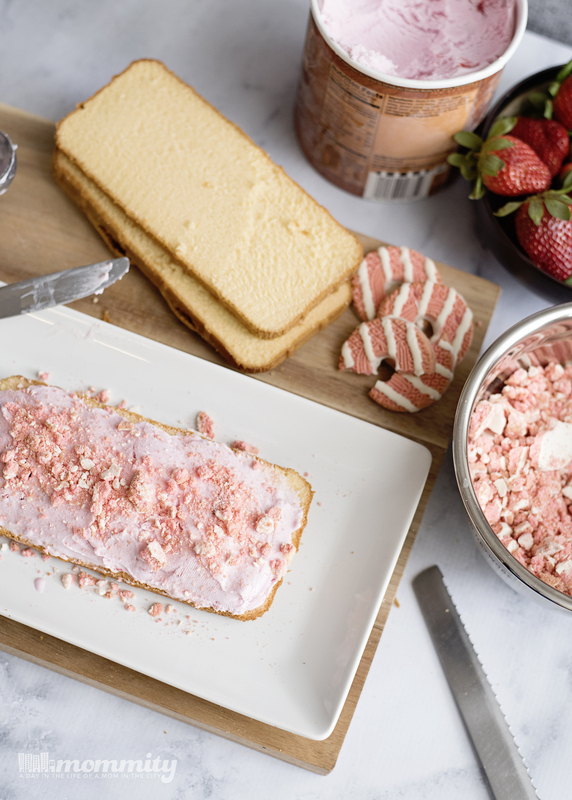 When the top is put on, coat the entire cake in whipped topping and crush more strawberry fudge stripe cookies on top. Place in the freezer for a minimum of 15 minutes, longer the better. Make sure you loosely cover the cake. Take out of the freezer, immediately slice and enjoy!